Born in Murano in 1945, he began apprenticing very young, learning the first secrets of glass making from master Ermanno Nason at Mazzega's. 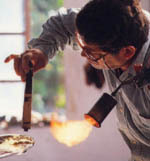 In 1960 his practical education continued at Salviati's where he works with master Livio Seguso, following him when he opened the new furnace Seguso Arte e Vetro. Cammozzo worked for and with Seguso for over 20 years. In the meantime, Cammozzo also refined his artistic skills taking numerous classes taught by Anzolo Fuga, Henry Mavrodin and Carlo Tosi, and had his drawings and works awarded in different occasions. Master Cammozzo is an expert in the technique called "a massello" but he can also successfully blow glass and design its own creations.